Today’s elephants are a remnant species, the last of order Proboscidea. The order name refers to the proboscis – the trunk. There are two species, the African and the Asian (Elephas maximus), that have traditionally been accepted. All elephants are gray (though Asians often show de-pigmentation), but any elephant can look red or gray-green or charcoal because of a recent dust-bath. 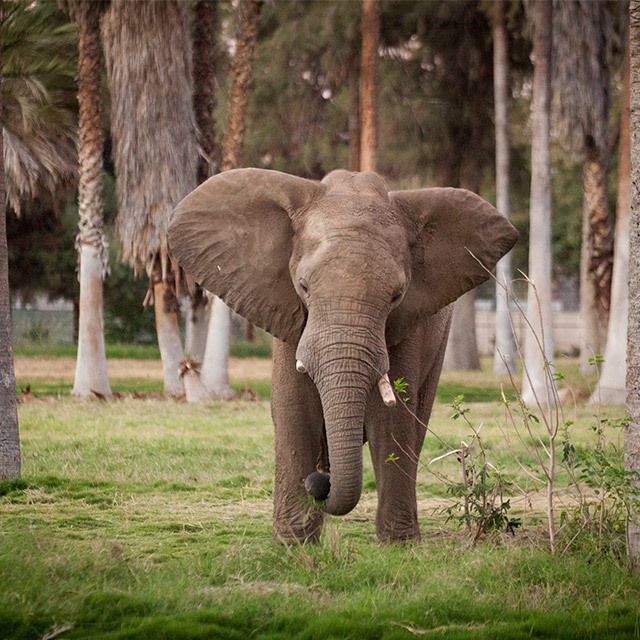 Scattered African elephant populations occur across sub-Saharan Africa. Preferring the more brushy Acacia woodland savannas, some frequent heavily forested areas and a few populations inhabit parts of the Kalahari Desert. They prefer to be near water, but well-worn paths cross some long distances from feeding areas to water-ways. Wild – Elephants are herbivores that primarily browse, taking fruit when available. Zoo – Oat grass, plus bamboo and tree browse, and various fruits and vegetables. The trunk is obvious, but the short neck is often overlooked as the reason for having the trunk. The neck is short to better support the very heavy head. The head is not as heavy as it might be, because the skull around the brain is not solid. It is laced with sinuses, air bubbles that add size but not weight. Elephants are indeterminate in growth. Even a geriatric bull is adding millimeters to his size every year. The fact that the cheek-teeth come in sequentially instead of vertically (as human teeth do) allows the ever-growing jaw to always accommodate teeth of suitable size. The teeth progress along the jaw in a conveyor-belt manner, each moving forward as the one in front wears out and is either spit out or swallowed. The 6th and final tooth in each quadrant is the size of a large loaf of bread and will last 30 or more years. Gestation is 22 months, and the single calf is very small, seldom over 200 pounds. The cow will move a short way away from the herd to deliver and the calf must stand within minutes of birth. They must quickly rejoin the herd. The new calf will suckle within the hour but will take days to ‘gain control’ over its trunk. The development of an elephant over its life can be compared to that of humans. A teenager is a teenager, and wisdom lies with the elderly. Elephant societies are matriarchal, the oldest (most knowledgeable) females leading the extended family groups. Height Up to 13 feet. Mass Up to 15,500 pounds. Diet Elephants are herbivores that primarily browse, taking fruit when available. Learn more about our animals from the people who take care of them every day. Due to web-store maintenance, you will be unable to make online purchases today between 1:45 pm and 3:00 pm. We apologize for the inconvenience. Poaching for ivory is a continued threat, as is habitat fragmentation by human development. African elephants are IUCN listed as Vulnerable (Asian elephants are listed as Endangered).